The very small and rather unusual passerine family Corcoracidae now contains just two superficially dissimilar species: the White-winged Chough and the Apostlebird. Both are endemic to Australia. There is no well-accepted common name for the family, but sometimes the terms Australian mud-nesters or mud nest builders are used. 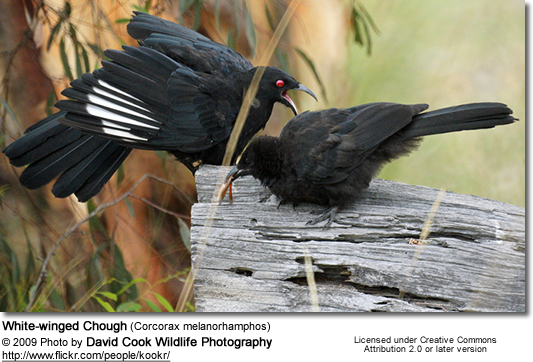 In the field, the relationship between Choughs and Apostlebirds is immediately apparent: both species are highly social, spend much of their time foraging through leaf litter with a very distinctive gait, calling to one another almost constantly, and both species respond to a human interloper by flying heavily to a nearby tree, where they wait for the disturbance to pass, often perching close together in twos and threes and allopreening. 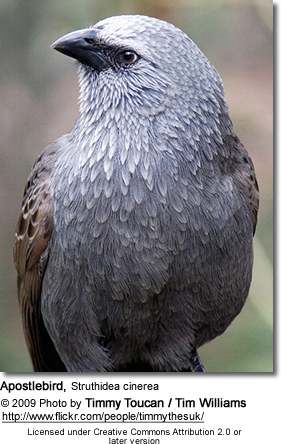 Apostlebirds are so named because (it is said) "there are always 12 of them"! In fact, group size typically varies from about 6 to as many as 20.